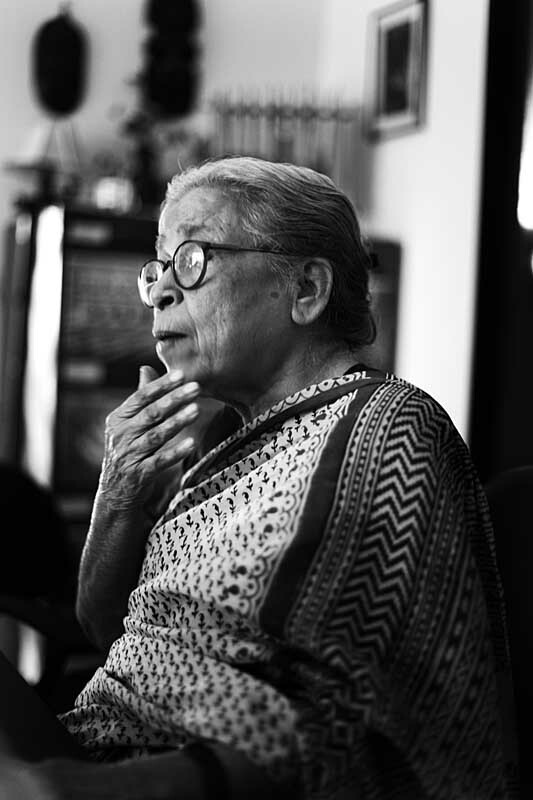 Mahasweta Devi (Didi ? elder sister ? to all of us) had been a giant of a figure in South Asian literature for as far back as I can remember. ?Jhansir Rani? (The Queen of Jhansi, 1956), Hajar Churashir Maa (Mother of 1084, 1975) and?Aranyer Adhikar? (The Occupation of the Forest, 1977) her powerful novel about the Santal uprising were what we knew this celebrated writer and activist by. That she was a tease and loved to sing, and didn?t mind the odd practical joke, was a side to her that had remained private. What should have been apparent was the rebel in her; her uncompromising stand for the oppressed, and her clear position as to which side of the fence she belonged. Suvendu Chatterjee of Drik India knew her well, and they had been planning a film on her. When he asked, on our behalf, if she would inaugurate Chobi Mela-V in 2009, she had readily agreed. I also had another plan in mind. Even with our limited budget, we had always wanted Chobi Mela to be a meeting place of great minds. 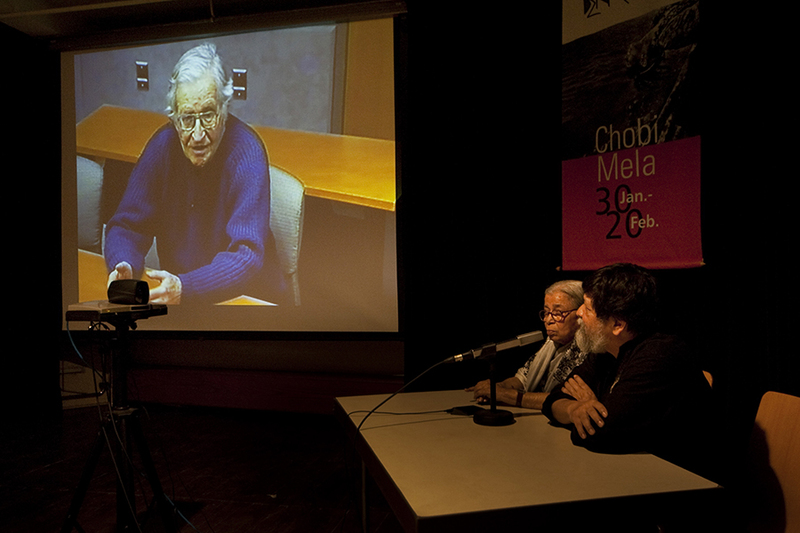 So we?d invited Noam Chomsky, Stuart Hall and Didi to have a conversation through videoconference. It would be a highlight of the festival. They had all agreed, but Stuart became too ill to join and Carol, Noam?s wife of over sixty years passed away and I was unsure whether I should press forward at such a time. But Noam?wanted to honour his commitment and I felt it would help him cope with the loss. ?The day? Didi? arrived, there was no electricity in our flat in Dhanmondi. Non-plussed?she?climbed up the five flight of stairs. Once inside and surrounded by books, she was at ease. She loved talking politics, so she got on like a house on fire, with Rahnuma. Moderating a conversation between these two giants was daunting but immensely pleasurable. They both had a healthy disrespect for the colonial project, and wasted no time in debunking both the ?war on terror? and the war mongering that was taking place on opposite sides of the globe. It soon became clear that India and the USA were not too different when it came to corporate interest or imperialist agenda. The conversation went well over schedule, but this time I wasn?t complaining. Didi did take a rain check on the all night dance party on the riverboat afterwards! Noam had a somewhat better excuse. 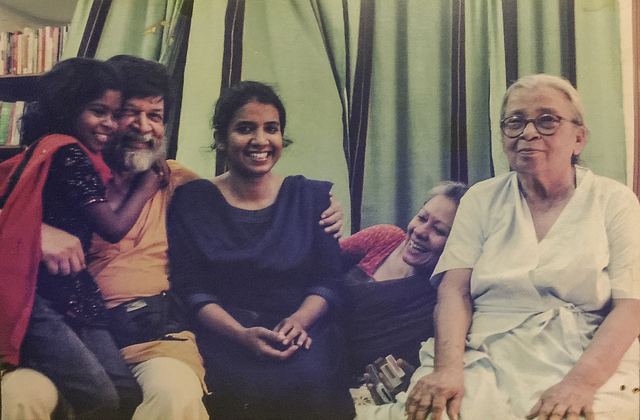 Noam Chomsky and Mahasweta Devi discussing ?Freedom? 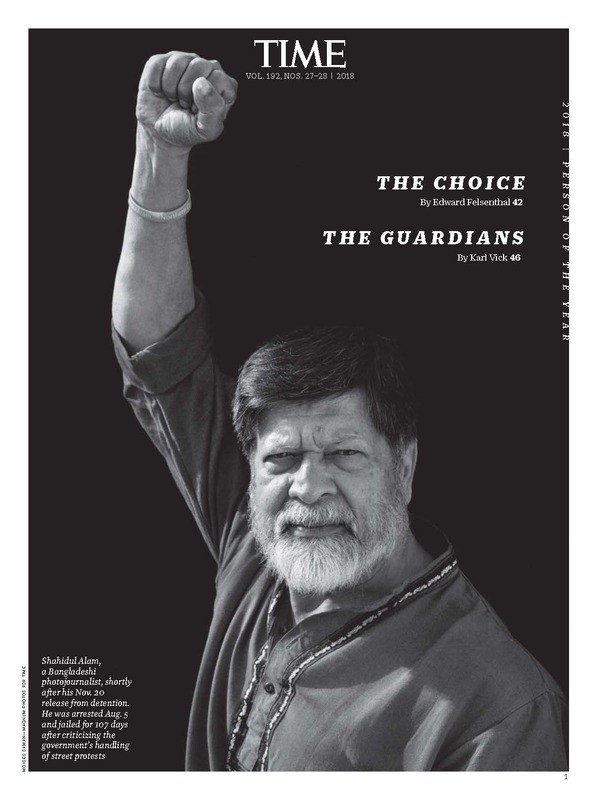 at Chobimela-V, the video conference was moderated by Shahidul Alam. Goethe Institute, Dhaka, 30 January 2009. ? Drik. At the opening of Chobi Mela, I got a call from the Prime Minister?s office, she wanted to meet Didi. One doesn?t normally turn down prime ministers. Insisting that we could only spare so much time as we had to get back to the video conference (I didn?t want it to be too hectic a day for Didi), we went along to the Prime Minister?s residence. 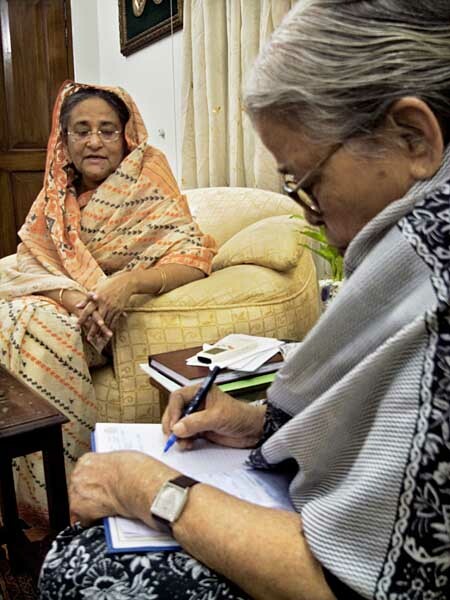 Didi was fond of Sheikh Hasina and clearly the Prime Minister had huge respect for her, so I was left with the problem of extracting Didi back to the festival. Apologising profusely for rushing off, we arrived at the Goethe Institute in Dhanmondi, barely in time for the videoconference. I needn?t have worried. There were problems at the MIT end, though it had nothing to do with a Prime Minister or a President. The audience was ready, we had collected ourselves, but the screen showed what looked like an empty school bench. Noam rushed in sometime later. This time it was his turn to apologise. The MIT apparently has two videoconference suites and he had been taken to the wrong one, and when they did eventually get to the right one the door was locked! Since Didi didn?t go to the party, the party came to her. Our flat was constantly full of visitors, journalists, writers, activists and even some relatives. Didi wasn?t much into family life, being much more into the cut and thrust of the power struggles than discussions on family matters. The flat seemed eerily empty when she was gone. But she was back again soon. Our show ?Crossfire? 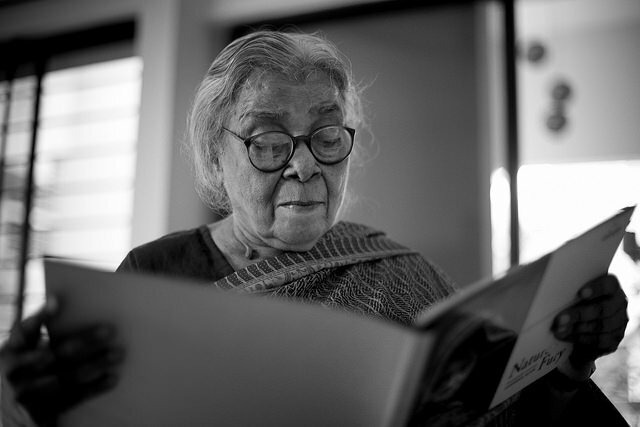 on extrajudicial killings was in March 2010 and we couldn?t think of better people to open it than the indomitable Mahasweta Devi and Bangladesh?s most outspoken editor Nurul Kabir. The show, curated by the Peruvian curator Jorge Villacorta, was looking very good. The international guests, from Latin America, Africa, Europe and Asia had gathered. The media had surrounded the gallery, but the government had other ideas. Armed police stormed in and shut the entire Drik office. Undaunted Didi and Nurul Kabir gave their opening speeches to a packed audience on the street outside. Somewhat theatrically, Didi symbolically launched the show by removing my handcuffs. The government again had egg on its face. Despite her fondness for Hasina, Didi was not going to let partisan politics get in the way of social justice. Meanwhile, with the help of lawyer Sara Hossain, we took the government to court and won and kept the gallery open for a day. 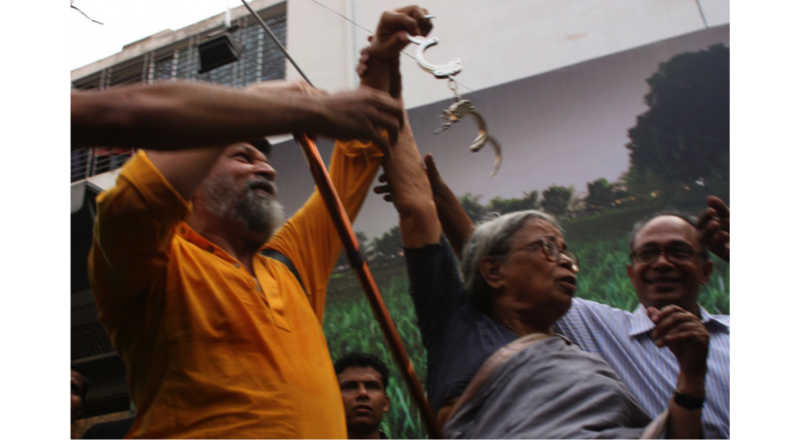 Mahasweta Devi removing handcuffs from Shahidul Alam as Nurul Kabir looks on, symbolic opening of ?Crossfire? exhibition on the street outside Drik gallery, locked down by police. Drik later took the government to court and had the show reopened. March 22, 2010, Dhaka. ? Drik. Later that year, facing increasingly agitated workers who demanded a fair wage, the government arrested labour leader Moshrefa Mishu. 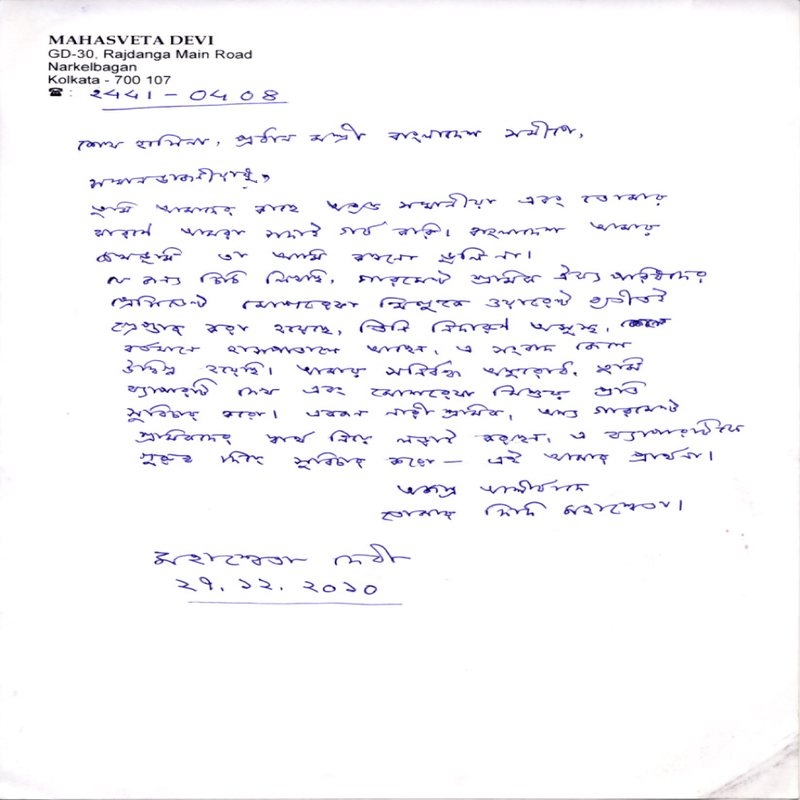 In a flash, Didi sent me a hand written letter addressed to Sheikh Hasina demanding that justice be done. It was this unflinching commitment to her ideals that separated Didi from the rest. Leading intellectuals and activists have chosen to stay silent, preferring expediency over conflict. Choosing partisan favour instead of taking an ethical stand. Comforting the comfortable instead of confronting power. Choosing convenient acquiescence over staunch resistance. Didi was clear where she stood. That is why neither the numerous awards, nor her celebrity status?were?able to buy her silence. When push came to shove, Didi was the fighter in the street, ready to stand her ground. Didi?s next visit was at the invitation of the Department of International Relations, Dhaka University. It was an international conference on ?Contemporarising Tagore and The World,? the university had co-organised it along with Visva Bharati of Santiniketan and Jamia Millia Islamia of India. They had put her up at a hotel. She rang from the hotel, insisting that she come ?home? once it was over. ?So, how was the conference?? Rahnuma had asked curiously. ?They spoke all day about Tagore, but not a word in Bangla,” was the wry reply. At home she would kid around, sing us Tagore songs, recite poetry and often fool around, but even here, a macho slip, or a patriarchal whiff, would soon get short shrift. You didn?t want to mess with Didi, when it came to power politics. That was why an activist home was what endeared her. The smell of the street pumped adrenaline through her veins. This was a fighter ever ready to speak truth to power. Didi loved photography and film. 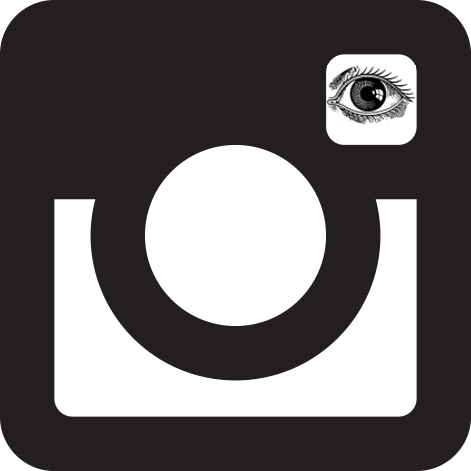 ?Still pictures are never still? she would say, ?they inspire us, move us, make us do things.? Clearly, doing things was what her life was about. Talking about Drik she would say, ?Knowingly or unknowingly, Drik has triggered a movement. I am waiting for the day when it will happen in my country.? For the millions of adivasis and other dispossessed in India; for those trampled by the corporate face of Indian democracy; for the starving farmers who prefer suicide to living in an unjust world, you, Didi, have been the one doing it. I hope we have the guts and the integrity to follow.